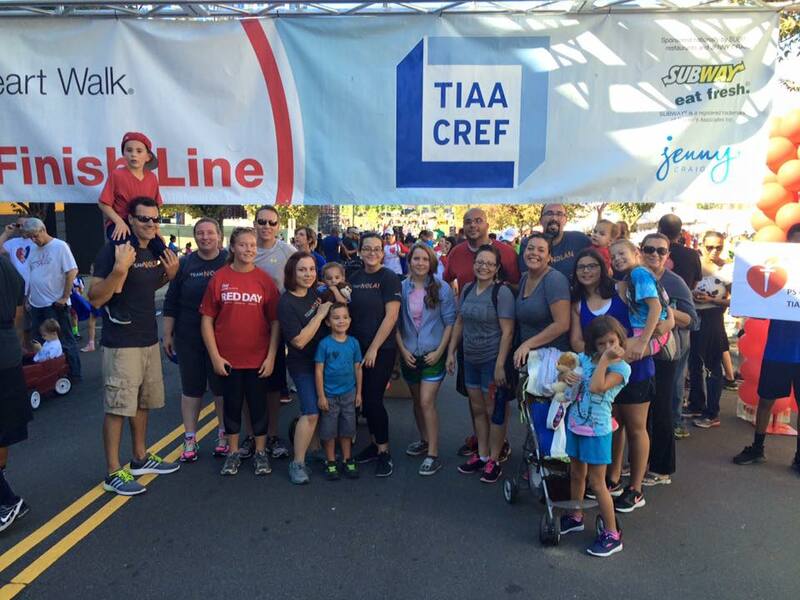 The 2015 Heart Walk | Half Heart. Whole Life. Is it just me or did September barely seem like it existed? Goodness, it just flew by. 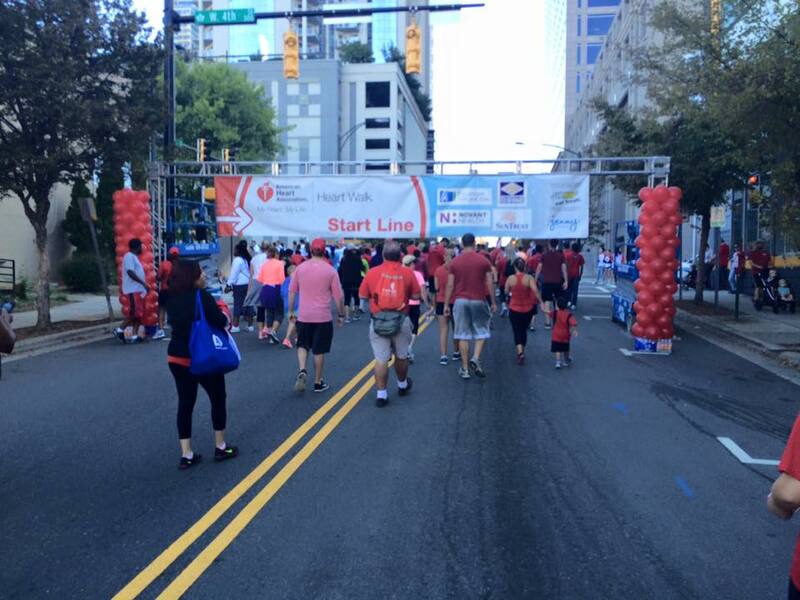 Anyways, September was here, and with it came the annual American Heart Association Heart Walk in Charlotte. It’s hard to believe this year would be my 4th year doing the Heart Walk and our 3rd together as a complete family. How quickly time goes by, right? 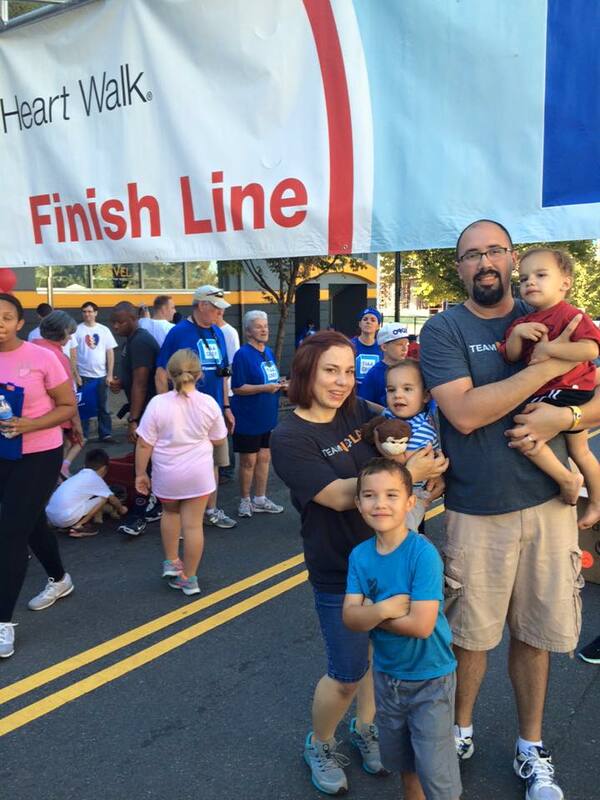 In the past we tried to put together an “official” Heart Walk team and a bunch of people signed up but for various reasons, only one of them actually came that morning. Last year we just did it as a family and it was really great. This year we wanted to do something a little different and invite our close friends to join us: these are folks that really stuck with us from the beginning of our journey with Nolan and even friends we met during the journey. Some we knew already from church when we found out we were having twins, and some of them we met for the first time when they came to our house to drop off food while Nolan was home from the hospital, others were our friends for even longer than that. Either way, these people have played such an important and supportive role in our lives, we wanted to do this year’s walk together with them. I texted everyone and we had a plan together. The weather the morning of the Heart Walk was a little cooler than usual, though it quickly warmed up. The start area was also in a new location in Uptown Charlotte, so that took a little getting used to…it was super crowded. 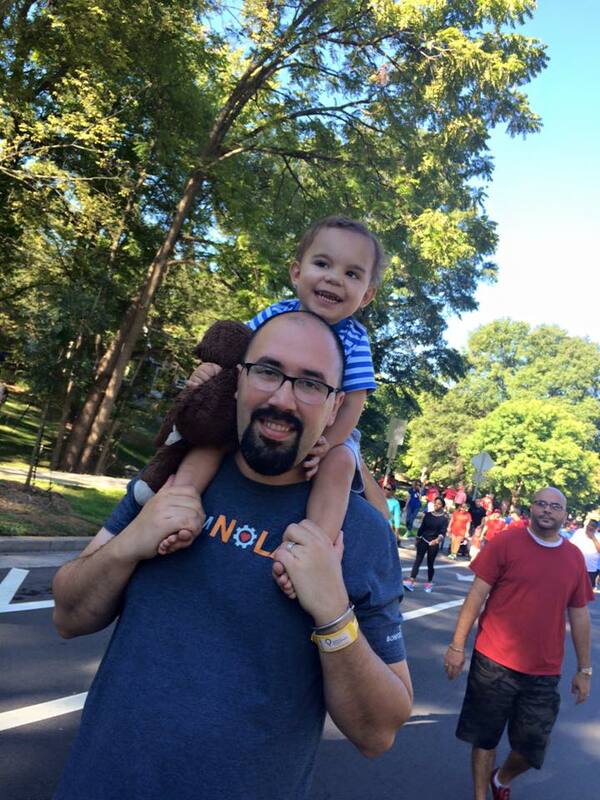 We met up with everyone, some of who were rockin’ their Team Nolan shirts, and off we went! Once we managed to get past the start line, the crowd thinned up a bit…we had like 18 people walking on our team so we kept a nice pace and it was great to spend it with my family and chatting everyone up too. Early on, though, there was quite a bit of excitement…because I saw Hugo! Hugo is the mascot of the Charlotte Hornets and he’s one of my favorite mascots ever. Even though I grew up in Connecticut, the Charlotte Hornets were crazy popular back home when they entered the NBA, and I thought Hugo was the absolute coolest. I loved watching him in those mascot dunk contests (as Super Hugo) and I also knew the code to play as Hugo in the old school game NBA Jam (yeah, you remember that, right?). So yeah…I was totally geeked to meet Hugo, and I held everyone up so I could take a picture with him and Hudson. 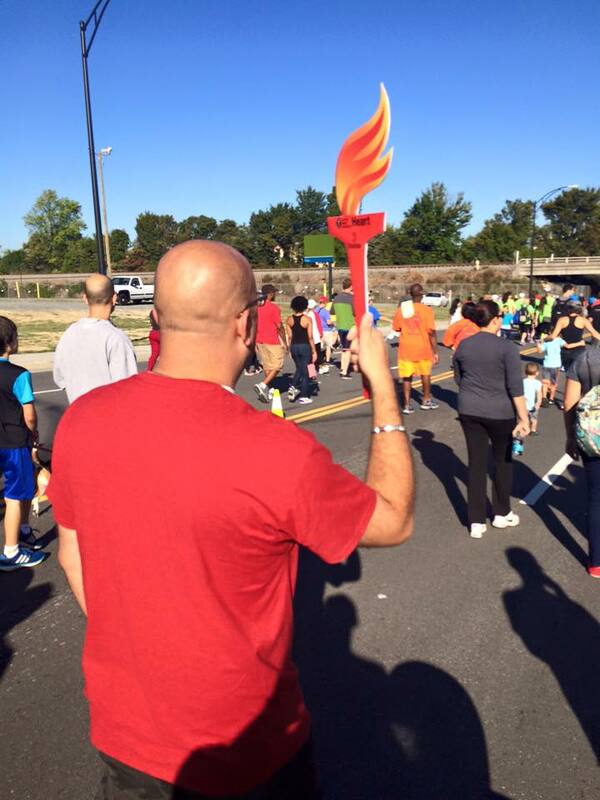 My buddy Robert carried this torch with Nolan’s name on it. He said he was preparing for the Olympics…good form, my man! 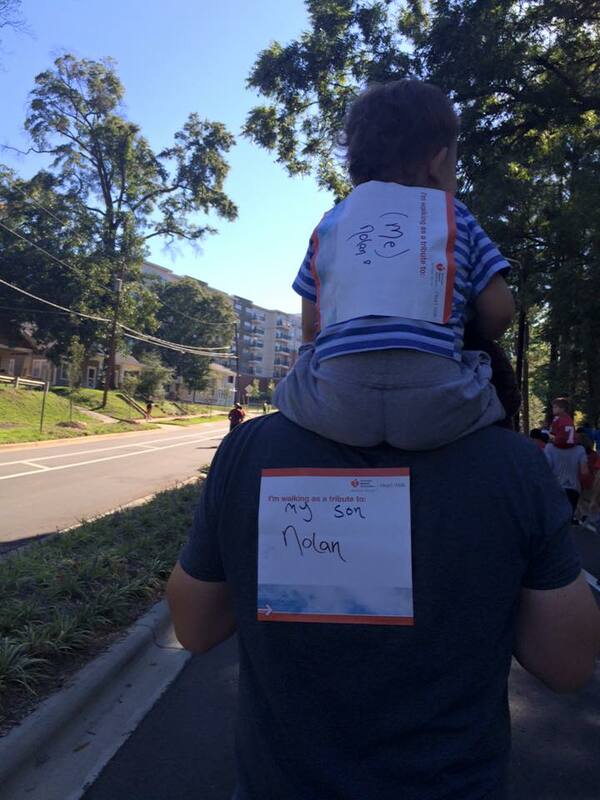 About halfway through the walk, I carried Nolan on my shoulders, and I just love this picture because it makes me so happy he can join us on this walk and even if I had to drag myself, I would walk in his honor. Almost all of the people on our team wore these signs with his name and people kept coming up saying hi to Nolan and saying they were just dying to meet him because of all the signs. Of course, Nolan ate it all up. Possibly one of my fav pics ever. We managed to finally get to the finish line, as the day started to really heat up. This is always such a great part for me because we do it as a family. It’s so moving. I love these people. They’ve done so much for us and we’ll never ever be able to repay them, no matter how hard we try. I was honored they joined us on this day. I remember 3 years ago when I did the first Heart Walk all by myself, 3 days after we found out that Nolan would be born with HLHS. I remember that it was so emotional and at points I was just pushing along to finish. Fast forward a few years and we’re 18 strong. This year was so amazing! 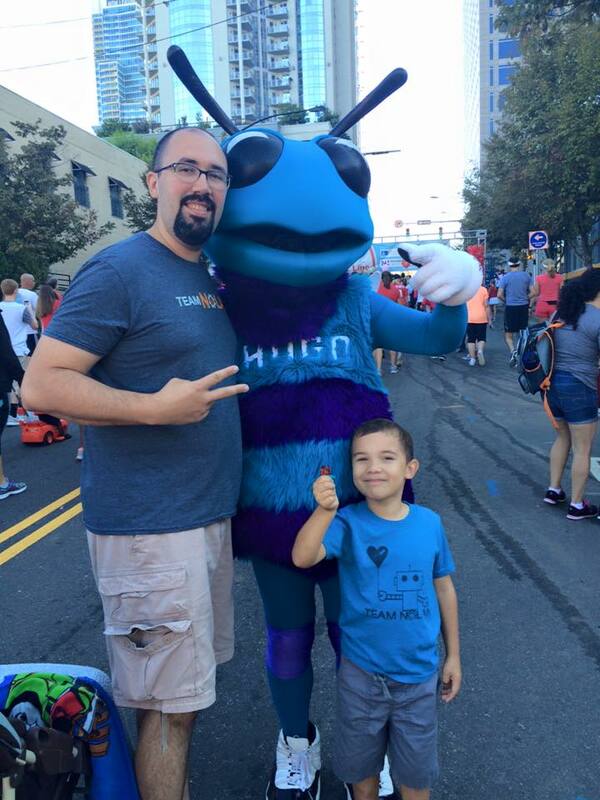 Posted on October 6, 2015, in awareness and tagged American Heart Association, Charlotte Heart Walk, Charlotte Hornets, CHD, congenital heart defect, Heart Walk, HLHS, Hugo, Hugo the Hornet, hypoplastic left heart syndrome. Bookmark the permalink. Leave a comment.